Marcy White was like just about every other young mother-to-be. She was excited, nervous, happy and brimming with the anticipation of seeing her new baby boy. But when her baby boy Jacob was born, something didn’t seem right. Ten long months passed as Marcy tried in vain to soothe her baby’s crying and to feed him so carefully, so as not to evoke a vomiting episode. During Jacob’s first year, Marcy White devoted herself to trying to find any clue to what might be causing her baby’s distress until finally… a diagnosis. 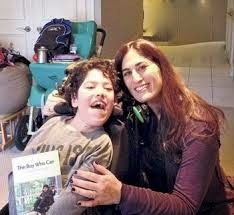 Pelizaeus-Merzbacher disease, or PMD, is the name the doctors gave to the genetic condition that afflicted Jacob. PMD is nasty – it is a progressively debilitating disability caused by a genetic anomaly. The prognosis is dire, but then again, the doctor who wrote that medical textbook never met Jacob Trossman… or his mother. “Jacob is amazing and I adore him. There is nothing I wouldn’t do for him. But being his mother can be so hard at times—emotionally draining and physically exhausting. And I never feel like I’m doing enough. I always think I can do more. When a new idea comes to mind, I berate myself for not thinking of it sooner. Because small things can have a huge impact on Jacob’s life and a few months can make a difference. Maybe. Marcy’s writing style is both urgent and intimate. Reading her story of Jacob, I felt I could have been reading my own story – I wonder how many of us share difficult experiences that we very rarely discuss. ME: When you decided to write your book, did you have a particular social or political change agenda in mind? MARCY: Yes! I hoped (and still do) that medical professionals, educators and policymakers will read the book. Despite their best intentions, these people only see a tiny fraction of our lives – the small window of time we are in their offices or classrooms. My intention with The Boy Who Can was to give a thorough description of my life with Jacob, the good parts and the challenges, so that they can have a better idea how their actions and inactions affect us. ME: How do you think telling our stories of family life with disability helps all of us, as a community? How does our storytelling help society as a whole? MARCY: I hope it can give other families like ours strength and hope that they, too, can create full lives for their children. Almost everyone knows families like ours. I hope The Boy Who Can can help these people- friends and colleagues of parents of kids with special needs – understand some of our experiences and challenges. And realize that we need our friends more than ever before. ME: How has your life changed since writing your book? MARCY: It hasn’t….. yet. My intention is to use the book as a starting point to find opportunities to talk to large groups of people about my experiences. Our lives are hard and there are many ways people of influence can bring about change. I want to reach these people and help put a face to the issues. It’s harder to ignore if people know the faces and stories of the families. ME: Can you give us an update on your family? MARCY: All most parents want is for their children to be healthy and happy. Jacob is as healthy as he can be. He’s a very happy boy whose disease is not contagious…. but his laughter is! This is a terrific book for anyone who is new to disability parenting. The voice of Marcy White will assure you that you are not alone. 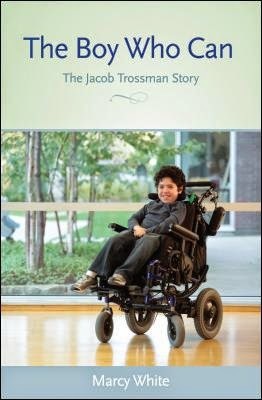 “The Boy Who Can — The Jacob Trossman Story” is available as an E-book through iBooks. Also, order via Amazon in Canada and the USA. Also available at Chapters Indigo in Canada.